the causes identified by Prime Minister Malcolm Turnbull – or unofficial backbench energy spokesman Tony Abbott – are not the same as the causes power industry experts and regulators highlight. The energy industry, the agencies that oversee the energy markets, and most of the customers are united around a common view. But not Turnbull with his cabinet and fractious back bench. Basically, pass the CET and get on with investment in new energy, then leave the management to the women appointed to manage it all. In this CC I’ve selected some current items about renewable energy, mainly solar, plus a few to remind us that we live in a changing climate. Here I’ll briefly note a new report by the Climate Council Powering a 21st Century Economy: Secure, Clean, Affordable Electricity. It covers much familiar ground, but a couple of pieces of information are worth noting. First, on page 17 it has a table that shows 453MW of coal and gas power failed in SA on 8 February, on 10 February it was 3050MW in NSW and on 12 February 787MW in Queensland. Second, on page 18 it gives the cost of new build power, showing renewables cheaper than gas and much cheaper coal even without CCS, which, let’s not fool ourselves, is the only way coal could be clean. Sydney and Melbourne have been warned to prepare for scorcher days reaching 50 degrees Celsius by the end of the century — even if global warming is contained to the Paris Agreement target of a 2C increase. Actually a more expert report of the research from Liz Hanna of the ANU shows that the researchers were thinking of those temperatures by 2040 or earlier. Electricity grids transmit less power as the ambient temperature rises, generators are apt to fail. Emergency services are impeded – in a heat wave in Melbourne in 2014, 203 deaths were reported to the coroner, more than twice the average. Dr Mark Monaghan says A lack of action on climate change is putting people’s lives at risk. Research conducted in 2014 by Sophie Lewis from the Australian National University found if greenhouse gases in the atmosphere were at pre-industrial levels, Australia would break that September record just once every 704 years. But current levels of greenhouse gases make that 16 times more likely. Equally amazing, “of the 20 warmest monthly global average temperatures in the satellite record, only September 2017 was not during an El Niño,” reports Dr. John Christy, director of UAH’s Earth System Science Center — and an infamous climate science misinformer. Renewable energy accounted for two-thirds of new power added to the world’s grids in 2016, the International Energy Agency said, but the group found solar was the technology that shone brightest. New solar capacity even overtook the net growth in coal, previously the biggest new source of power generation. The shift was driven by falling prices and government policies, particularly in China, which accounted for almost half the solar panels installed. The Paris-based IEA predicted that solar would dominate future growth, with global capacity in five years’ time expected to be greater than the current combined total power capacity of India and Japan. The cost of solar PV has hit a stunning new low – with a bid for a 300MW solar project in Saudi Arabia pitched at just $US1.79c/kWh – or $US17.9/MWh ($A22.7/MWh) – with no subsidies. The stunning offer – coming in the oil kingdom’s first major tender for solar power – represents a significant fall of 75 per cent in costs below those considered “not credible” less than two years ago. Coal is down, the big winner is gas, and renewables other than hydro and biofuels are up, but not spectacularly so. We can only hope they are wrong. They emphasise uncertainty, so they are almost bound to be wrong. 6. What did the IEA forecast, and are they right? 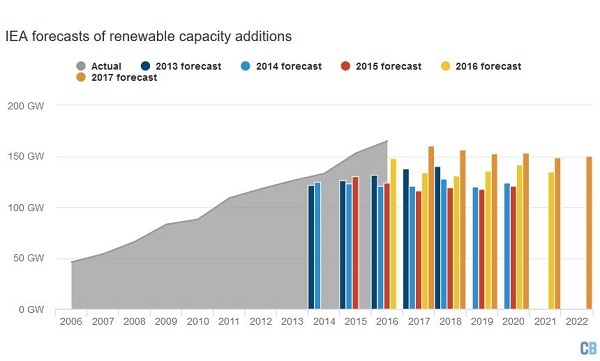 Analysis: How have the IEA’s renewable forecasts changed? The first headlines the world’s renewable electricity capacity rising sharply over the next five years, expanding 43% on today’s levels. But expansion levels off. Eventually one would think they’d learn. 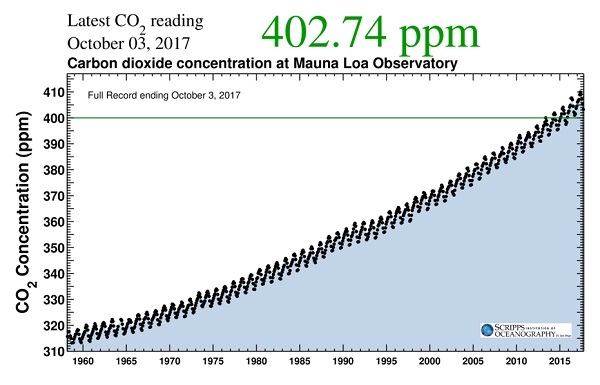 I think, however, we should keep our eye on the Mauna Loa graph. 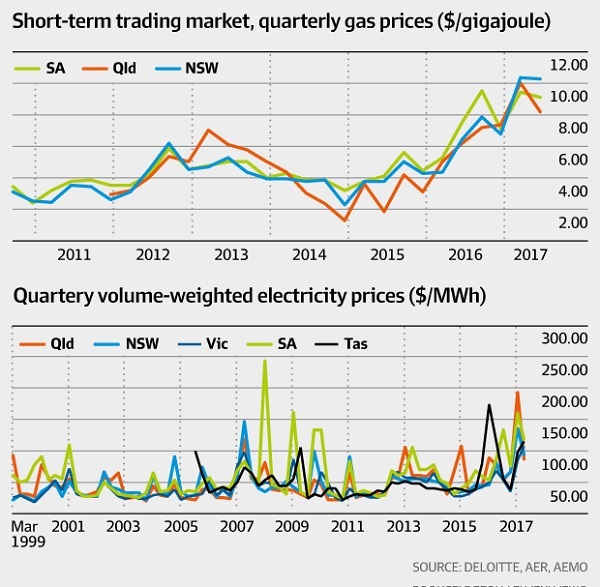 Back on 27 July the AFR ran an article Tables turned on east coast gas supplies. 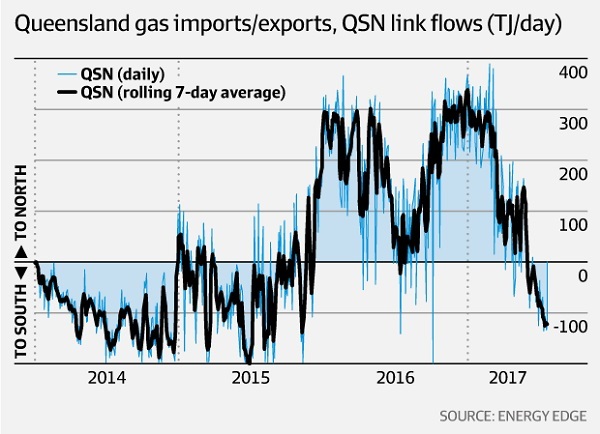 For over 18 months Queensland has acted like a giant Hoover, but now there are signs of a sea change in the flow of gas. It’s about increased supply and a warmer winter in the south, rather than the PM’s jaw-boning as such. What happens to price in longer term contracts is another matter. 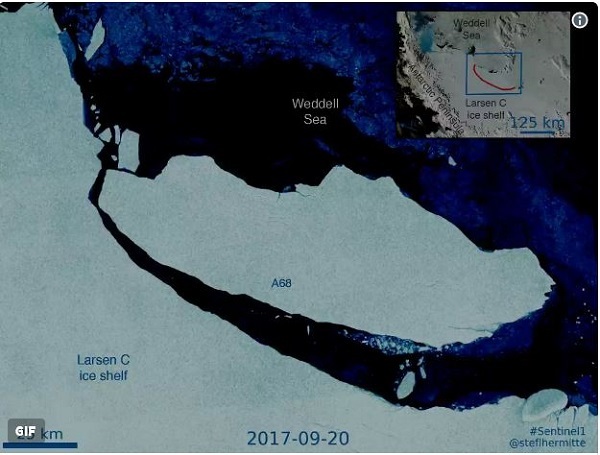 Larsen C iceberg is very large – about a trillion tons, in area about equal to the state of Delaware, or four Londons, with a volume of about 462 million Olympic size swimming pools. In depth it’s about the Statue of Liberty times two. But what the scientists are telling us, we can only really burn… afford to burn less than 30% of the existing fossil fuels to have a 50-50 chance of staying below 2°C. But we know at the moment that 2°C is really too high, and you have to then say, well, is 50-50 a sensible level of risk to accept? I mean, many of you in the audience are engineers. You don’t go out and build a bridge which has a 50-50 chance of falling down; or a building. You don’t get in a plane to Melbourne with a 10% chance of not getting there. But we’re accepting that the future of humanity can be predicated on a 50-50 chance of meeting this global climate target. It doesn’t seem frankly to be terribly good odds. So, there’s something wrong I think in the way that we’re looking at this. Clearly, emergency action is required. When will our leaders take effective action? There’s going to be more about what Ian Dunlop says in my next post. AfR are live-blogging the Summit, and obviously had some of the papers beforehand. It looks as though the Feds will walk away from the CET, say affordability and reliability are the key. Submissions reduction will look after itself with technology change. They are still obsessing about Liddell, however. There is talk of taxpayer funds to help. It’s clear from vesey that if they want Liddell they’ll have to confiscate it. AGL are going to do what they are going to do whether there is a CET or not, although that would be nice. Seems there is double what we’ll lose from Liddell in the pipeline, but the Feds are not impressed. They still think Liddell coal power is “dispatchable”. Frydenberg is saying they will have to change the NEM operating rules. He doesn’t seem to realise that there is an Australian Energy Market Commission and an Energy Security Board operating under COAG, where they have one vote. Jay Weatherill says the Feds have shown they can’t lead and should just get out of the way, and leave states to run the NEM. Audrey Zibelman says we just need to get on with it all. The market isn’t so much about to change, it has changed, and AEMO is getting on with making it work. It’s a happening thing. Had a chat with my wife. I said Mal and Josh were just being ignorant. She was not so charitable, reckons they know exactly what they are doing. She’s probably right. Jennifer Hewett in the AFR says Josh wants to be PM some day. The sad fact is that since Mal topped Tony, whoever leads the Liberal Party has to be acceptable to Barnaby Joyce. The AFR editorial says the power problem is basically politics. Jay Weatherill put it very plainly on RN Drive. If you have an externality you want to get rid of, you put a price on it. The Energy Minister Josh Frydenberg hinted today that the ever-falling cost of renewables could allow the Government to prioritise reliability ahead of emissions. But we may have a clean energy target regardless; the states are poised to fill the vacuum left by the Commonwealth by implementing their own CET. He’s very serious about it and reckons the Liberal states of NSW and Tas are open to moving on it. Remember the Finkel Review was commissioned by COAG, not the Commonwealth. And the NEM was initiated by COAG, not the Commonwealth, with the initial law being passed in the SA parliament. Giles Parkinson sees the Coalition wrestling with its inner demons. David Leitch says Frydenberg has just made an election-losing speech. State governments from both sides of politics have called on the federal government to decide on a carbon policy in line with the Finkel review or risk an “unravelling” of the national electricity market. Both Coalition NSW Energy Minister Don Harwin and Labor SA Premier Jay Weatherill said the federal government should respond by the end of the year to the recommendations in the Finkel review calling for either a Clean Energy Target or a carbon emissions intensity scheme. Mr Weatherill made a radical proposal that the states should sideline the federal government, take back control of the national electricity market and pass a carbon policy of their own. He said a “civil war” in the federal Coalition party room over climate policy had caused a stalemate that needed to be broken. He said that if the federal government confirmed it was walking away from a Clean Energy Target, the states would “get cracking” on their own scheme. “There is no barrier to doing that,” said Mr Weatherill, who said other premiers were open to the idea. That’s indeed a radical idea, Mr Weatherill. Many electors are sceptical of the existence of State governments; if the States got this particular act together, they would be stars! Better get Nick Xenophon persuaded of its wisdom, in the SA case. Posted at resilience.org on 16 Jan 2017, is the article Will the US Really Be a Major Energy Exporter? 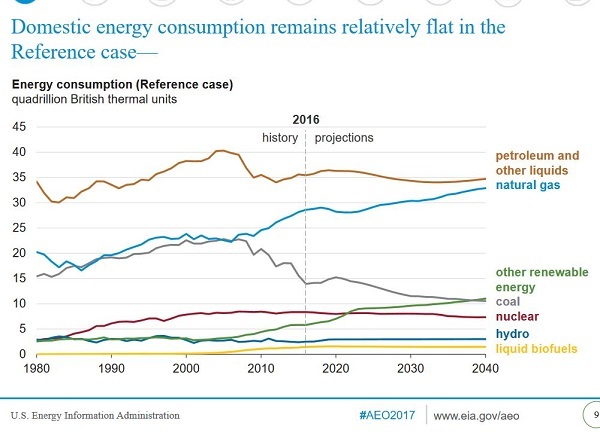 looking at the US EIA’s Annual Energy Outlook 2017 projections. I think it would be unwise to accept EIA AEO projections uncritically. The AEO projections shown above are clearly incompatible with the requirements of the Paris Climate Agreement. Are we heading towards a post- ‘peak oil’ world? 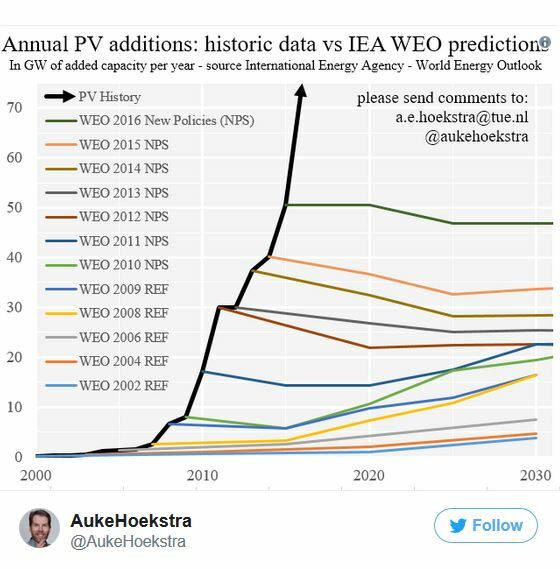 In Figure 3.16 the IEA shows for the first time what will happen if its unrealistic wishful thinking does not become reality during the next 10 years. Peak Oil will occur even if oil from fracked tight sources, oil sands and other sources are included. It is this figure that led me to congratulate Fatih Birol on a good report. My comment was that the IEA was rapidly approaching the same viewpoint as that held by the Global Energy Systems (GES) research group of Uppsala University. Is IEA’s WEO-2016 Figure 3.16 wrong? 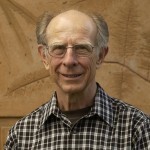 Are Michael Hovers’ comments wrong? What’s the evidence? What are the implications for our civilisation if they are close to reality? Is our society prepared for it? 	Jet fuel stocks: were between 15 and 25 days. Australia is the only one of the 28 IEA Member countries that continues to fail to meet its 90-day fuel stockholding obligations. Please see Engineers Australia’s (#02) submission at this Senate inquiry. What to do? Become informed and ask our leaders/representatives inconvenient questions! Liquid fuel security is critical for our transport systems, as currently configured. Petroleum is embodied in just about everything we touch. But ask our political elite what planning is being done for an inevitable post- ‘peak oil’ world, or for an unreliable/disrupted supply, and see what the response is. As an exercise ask your local council whether they have a post- ‘peak oil’ policy – most don’t – and those that don’t are likely to say that’s a State/Territory and/or Federal issue. Then ask your State or Territory Member of Parliament – they’ll likely say that’s a Federal issue. Then see what your Federal Member says. I have for all 3 tiers of government for where I reside, and my perception is this issue is all too difficult for our leaders/representatives to deal with. My assessment is our civilisation is woefully ill-prepared for declining and/or unreliable/disrupted petroleum fuel supplies. More people need to be asking our leaders/reps inconvenient questions, and perhaps then effective change may come. Geoff Miell, to your last point, Peal Oil solutions are largely the same as Climate Change Action solutions. Electrification, reduced consumption, population growth minimisation, liquid biofuel development and production, and, IMHO, nuclear powered shipping. While we have a raging climate change denialist running the government agenda from the back benches I can’t see how there can be any serious preparation in this country. ‘Peak Oil’ solutions are largely the same as Climate Change Action solutions – I agree. 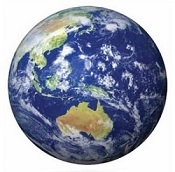 Even if people are rabid climate change deniers, or “skeptics”, surely they cannot deny we live on a finite planet? We cannot keep extracting finite oil & gas reserves at current rates (let alone increase them) and maintain current costs. Energy Return on Investment (EROI) continues to decline with fossil fuel extraction, because we go for the “low hanging fruit first” and are left with increasingly more difficult/costly to extract resources. Evidence I see indicates our world is fast approaching ‘peak oil’ supply & ‘peak gas’ supply. If we wait to confirm that these events are actually happening, it will already be too late, because it will take time to make the necessary changes to transition. We need to be making the transition while fossil fuels are still relatively affordable – keep the demand curve below the supply curve. I think there are clear, affordable, reliable, effective solutions for electricity generation, but we need to get cracking and start the transition in earnest. The really tough assignment for humanity is finding and implementing affordable and timely solutions to substantially diminish our dependency on petroleum – that’s where I see the greatest challenge is, and we are fast running out of time – and our leaders seemingly continue to ignore this one. 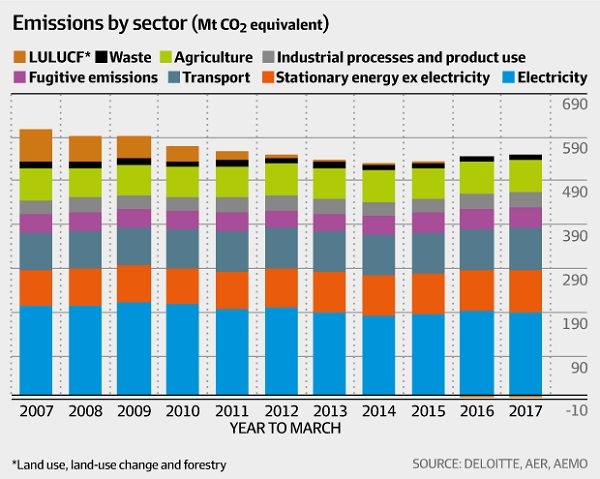 So, if you are having a conversation with a climate change denier or “skeptic”, re-frame the argument in terms of finite resources, resource depletion and rising resource extraction costs – see where it goes. Electrification – wherever possible/affordable – electrified fast & high speed rail – rail needs to become the dominate mode of long-distance (>200 km) land transport – discourage further gas network expansion and decommission residential gas supply network no later than 2035 (see my letter headlined Gas decline, published in ATA’s ReNew Issue 141 – Oct-Dec 2017 magazine, on page 12). Reduced consumption/increased recycling/increased efficiency – humanity is a profligate squanderer of energy and resources – we need to do very much better – we will likely be forced to do so soon. Zero population growth – Perpetual growth in a finite world is impossible – If you look at Ian Dunlop’s presentation referred in my first comment above, beginning at time interval 0:40:15, he shows humanity on a global scale is already consuming about 1.5 times Earth’s biophysical resources – clearly unsustainable, but no mainstream politician seeking re-election will touch this subject, yet – but I live in hope to be pleasantly surprised soon. Liquid biofuels – currently have very poor Energy Return on Investment (EROI) and unless this attribute improves significantly it will remain within a small niche market – see this discussion paper for more details. Aviation is most at risk because there are no affordable large-scale petroleum direct-replacement liquid biofuel alternatives, so far, and reconfiguring for hydrogen (or electric?) energy propulsion is hugely problematic and challenging. Evidence I see suggests the Western Sydney Airport that the Federal Government is proceeding with is likely to become a white elephant even before it becomes operational in the mid-2020s. Nuclear-powered shipping – Uranium and thorium are finite energy resources – Evidence I see would suggest there aren’t enough global supplies of high-grade uranium ores available to meet and sustain demand for current stationary energy (power station) needs beyond about the end of this century. Adding extra demand from more stationary generators and/or introducing mobile reactors for global shipping needs would put an even greater strain on existing supplies and deplete these reserves sooner. There are low-grade uranium sources but that means higher costs. There are substantially more reserves of thorium, but the thorium fuel cycle has still not been established and it’s a multi-stage process. As I understand it, a proportion of non-fissile (but fertile) Thorium-232 transfigures to fissile Uranium-233 in a nuclear reactor (similar in principle to fertile Uranium-238 transfiguring to fissile Plutonium-239), followed by a hazardous reprocessing operation to refine/concentrate the active ingredient before becoming available as a reactor fuel. And with nuclear-powered ships being mobile adds greater complexities and risks of unintended losses – incompetency, propulsion/steering failure, storm damage, fire, collision/grounding, sinking, high-jacking, etc. I’m not advocating this option be excluded/ignored, but I’m saying that the pesky problem of nuclear fuel resource depletion, and that nuclear engineering requires a much higher standard of skills/competency in design, construction, operation, decommissioning and disposal to minimise the risk of dire incidents occurring, cannot and must not be ignored. But I’m puzzled why the Australian Government is focussed on diesel-powered submarines to replace the current Collins-class, particularly when the apparent favoured design is a major untried modification of a French nuclear-powered design. As I expressed in my earlier comment: – I think substantially diminishing our petroleum fuel dependency is our greatest challenge, and there are no easy solutions. Perhaps that’s why our leaders are ignoring it – too hard – but that doesn’t help us all in the long-term! In the view of Sharanjit Paddam, principal at Deloitte Actuaries and Consultants and convener of the Actuaries Institute’s climate change working group. 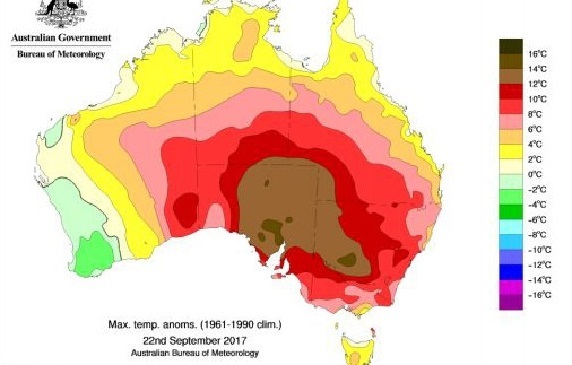 “If we don’t do anything and end up with a four-degree temperature rise, I think it’s inevitable there will be large parts of Australia where it is going to be uninsurable. Ootz, thanks for that one. Four degrees is usually taken to be the point at which civilisation as we know it falls apart.